MonoKey system, which comprises a set of MonoKey units and FunLearning DTT emulation software, is a complete DTT emulation system that can be used for autism therapy at the convenience of your home. MonoKey (UK patent No. GB2449791 and corresponding foreign patents and patent applications), which is available from our website as well as some of the leading autism centers in Indonesia and our representatives in UK and Australia, is an easy to operate wireless input device for kids who still can't use a keyboard or a mouse. With our FunLearning DTT emulation software, it can be used to do therapy sessions at the convenience of your home. We have also developed free MonoKey-compatible software titles. We currently have two software titles, Virtual Pet and FunLearning. Virtual pet is an "ABA inspired" virtual pet software that features a virtual pet that doesn't run around the screen. It tries to make as much eye contact as it can. There are two modes, free running (for learning), and constrained. In constrained mode, you can set the software to either show disagreemet or ignore mistakes. FunLearning is the customizable computer aided ABA/DTT emulation software that we can use for computer-aided DTT. It has a configurable reward system to reward children for their accomplishments, and it automatically downloads new modules/sequence chains from our growing module repository (we currently have around 300 modules!, covering most of the materials discussed in "The Me Book"). FunLearning features a visual interface to create new sequence chains and edit the existing ones. You can also configure the reward system with the visual interface. The visual interface allows you to incorporate your own movie clips, sound files, image files, or a combination of image and sound files. You can visit this link to download them. Visit our YouTube page to view other video clips. MonoKey was originally conceived as a computer input device for children with developmental differences comprising autism/ASD. However we found out that it is also suitable for very young children, even babies. You may want to consider purchasing our MonoKey if your little one finds using a computer mouse or a keyboard difficult. MonoKey can be used in conjunction with computer aided learning software, software implementation of ABA/DTT, or other educational computer games. We use the money we raise by selling the device to fund the development of our free software and to promote our autism awareness project. You do not pay any licensing fees to use our software titles. They can also be operated with a regular keyboard,a keypad, switches, or anything that can send keyboard data. Additionally, we also try to make them operable with mouse whenever possible. Easy to operate even for those with minimal motor skills (banging also works). Safe to use. The casing is too big to cause choking hazard and MonoKey doesn`t need a cable that may cause strangulation hazard. Moreover, the electronic circuit is Lead-free, RoHS compliant and the casing is made from food-grade plastic. Extremely tough to withstand a lot of punishments. 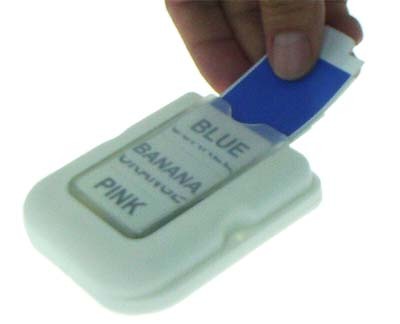 Convenient to use, since it has an insert for flashcards under the transparent covering. 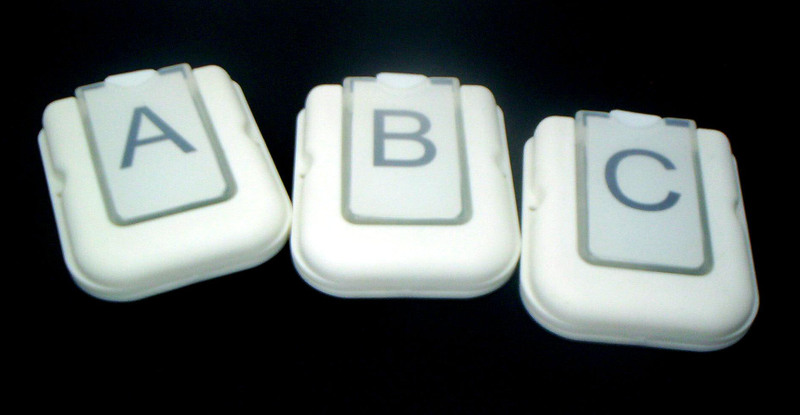 A set of MonoKey units can be used as input devices for the computer aided ABA/DTT software that we have developed, as well as other educational software titles. We've also made a few MonoKey-friendly educational software titles available free of charge. We are committed to develop more free software titles to help all children, and you can help us to accomplish it. For children with developmental differences, it can squeeze in a few extra hours of computer aided therapy after their regular therapy schedule, at their own convenience, without having to pay the cost of in-house therapy sessions or schedule a specific time slot. This is particularly beneficial for children who need substantial repetition to maintain previously learned materials. For very young children (including babies), it offers the opportunity to operate numerous educational software titles (including the free software titles downloadable from this website) and learn a lot of valuable skills including reading and math while having fun in the same time, without having to wait until they are able to operate a mouse or a keyboard.